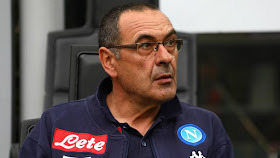 Chelsea boss Maurizio Sarri will spend more than 200 million pounds in the January window following the threat of a two-year transfer ban by FIFA. Last week, FIFA recommended that the Blues receive a ban on the transfer of four windows after an investigation into the signing of underage foreign players. The threat will push the Blues to work 24 hours a day in January to attract several targets before the ban comes. Express Sports reports that Chelsea is ready to face face-to-face with both Manchester United and City to sign Brazil's Alex Sandro of Juventus, with a £ 50 million, 27-year prize. Sarri is already on the verge of winning the race of £ 70 million to reach the extreme Christian Pulisic, 20, of Borussia Dortmund. The Italian manager will also pay 50 million pounds for the right-back of 24 years, Elseid Hysaj. The Blues also seek to invoke a 40 million pound repurchase clause in the deal that led central defender Nathan Ake to Bournemouth.